For over 25 years, Harbor Watch has been providing guests with breathtaking views, quality seafood and creative dishes. Let us help make your special event spectacular. We offer a variety of dinner banquet menus including a selection of seafood, land fare and surf and turf combination plates. All banquets are served with house salad, rolls with butter, vegetable and choice of starch. Please review the attached menu for selections. All food and beverage orders are subject to 20% taxable service charge, 6% MD state tax & 1% Ocean City tax. Policy and Procedures All food and beverage orders are subject to all State of Maryland and Ocean City tax, and a 20% taxable service charge. All prices are subject to change. Minimums The enclosed menu is designed to serve 50-300 guests. Services requested above or below these quantities are subject to additional fees. Please consult your catering sales manager when planning your events. Payment Procedure A non-refundable deposit of $1000.00 is required to hold the space. Availability is on a first come first serve basis only. A second payment is due six weeks prior to the function. Final payment is due prior to the function. Payments must be made by check, certified check or credit card. Please refer to your banquet contract for further details. Additional Labor Charges A Culinary Fee of One –Hundred ($100) will provide you with a chef for two (2) hours. An additional Thirty Dollars ($30) for each hour will be charged. A Bartender Fee of Thirty-Five ($35) will be charged for the first hour and Twenty ($20) dollars for each additional hour and any portion thereof. Two hour minimum required. A Shucking Fee of Thirty-five dollars ($35) per hour of preparation will be charged for the labor involved in shucking and preparing raw shellfish. A Room Set-up Fee of One Hundred Seventy Five ($175) for half the dining room or Three Hundred Fifty ($350) for the entire dining room will be charged for the preparation of the dining room to suit your specific layout. Linens All functions will be provided with green house linen napkins unless otherwise requested. Additional color linen napkins are available starting at $0.35 each White or Ivory Tablecloths are available at $4.00 each Coat Check Coat check can be arranged for your hosted event. An attendant fee will be charged at Seventy-five ($75) per attendant. Alcohol The Harrison Group prohibits any liquor being brought into Harrison’s Harbor Watch due to the state of Maryland Liquor Commission laws. These laws state that all alcoholic beverages being consumed on premises must be purchased from the caterers. Consumption of alcoholic beverages by persons under the age of Twenty-one (21) is prohibited in Maryland. Compliance with the noted and related laws of Maryland is the client’s responsibility and that of their guests. Anyone wishing to consume alcoholic beverages must present a valid form of identification proving they are of legal age of 21 years. We reserve the right to refuse service of alcoholic beverages to any individual for any reason. 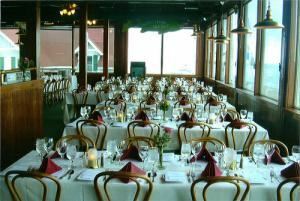 Harbor Watch has all your needs for wedding receptions, rehearsal dinners, corporate events, banquets and more. For your dinner buffet, choose from a selection of salads and soups, starches and vegetables, entrees and carved items. Your buffet includes assorted rolls with butter, coffee, tea, or ice tea. Please review the attached menu for buffet selections. We will be pleased to customize a buffet that suits your needs. Please contact your catering sales manager for prices and additional selections.